We've been trying to eat a little healthier around here lately. I've been cutting back on desserts and even trying to substitute for healthier alternatives when baking. 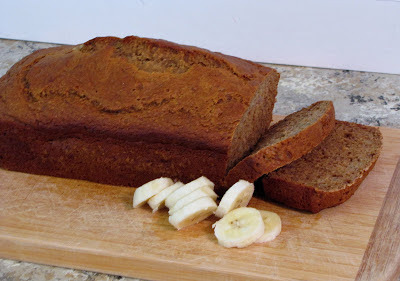 I found this recipe a while back from 8 Weeks to a Better You Recipes and since we were overflowing with bananas decided to give it a try. It was quite yummy! Even Claire liked it which is a big deal to meet her standard of approval. This is great warmed for breakfast or as an after school snack! 1. Preheat oven to 350 degrees F. Lightly grease a 9 x 5 inch loaf pan. 2. In a large bowl, combine flour, baking soda and salt. In a separate bowl, mix together applesauce and honey. Stir in eggs and mashed bananas until well blended. Stir banana mixture into flour mixture; stir just to moisten. Pour batter into prepared loaf pan. 3. Bake in preheated oven for 55-60 minutes or until a toothpick inserted into the center of the loaf comes out clean. Let bread cool in pan for 10 minutes, then turn out onto wire rack.